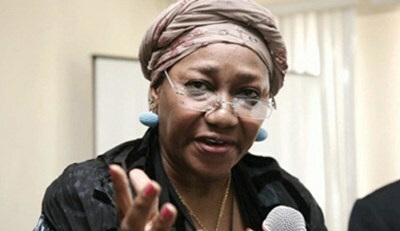 Sacked boss of EFCC, Mrs Farida Waziri, yesterday told reporters that she heard about her removal on TV, that she's yet to be formally communicated and also yet to receive any sack letter. She had to hear it on TV? That's uncool, Mr president! LMFAO!! I'm sorry i have to laugh but someone plz tell Farida that is how it was intended to be. Did she think they wld come with a bouquet of flowers with a hallmark card to announce her sack from office? They obviously wanted her to hear about it on tv. The person who wld even give her the official sack letter may be her secretary or one junior staff in the office! That's 9ja government 4 u. that's how they operate. They hire u and fire u at any given time. No position is guaranteed. Goodluck with the search for a new job! Easy Come . . . Easy Go. @Kingsley. it seems u've not been living in this country. Which kind of stupid question is that? Look for today's thisday newspaper. how did she hear of her appointment? @ken you have said it all ! If she like make she hear her sack inside transformer, i have lost complete faith in that geographical spot call Nigeria! It's monumental waste of space. Expect nothing good from Nigeria this generation, it's a wasted generation. i have a question:how can mrs farida discribes GEJ? haba @ least give her a notice first. lets be civilized! Ken God bless you for that quote. What was she expecting, seriously? In the first place she got the job on a platter of gold and now she is gonna lose it on that same platform... 9ja for u!!! I cant stop laughing oooooo......is she surprised???? Meanwhile, I hear say the replacement na the definition of corruption. I no know book oh! Na hear naim I hear! Nigeria, "monumental waste of space", "wasted generation"? My analysis is that you are full of hate and jealousy. Yes, Nigeria is going through rough patches, politically, economically and otherwise, but which country isn't? You've lost faith in Nigeria, because you've never been a Nigerian, never will be, so, mind your own country, and quit making assertions on our behalf.